After a long walk this morning I came home to have a yummy breakfast with my nice home made papaya marmalade. This is a very easy recipe to make and delicious, if you want to make it a bit extra special, you can add 3 arbol chilli flakes to give a bit of a punch to it, I like my marmalade to have that punch as I can eat it for breakfast with some fresh papaya and cream cheese or for lunch in a sandwich with some fresh cheese and spinach leaves or you can even have it in a cheese board with some hard cheeses. Heat the papaya, water and lemon juice in a large sauce pan, once it has been cooking for around 10 min, mash it very well to get a pure consistency. Then add the jam sugar and stir continuously until dissolve then let it simmer, stir from time to time, once the sugar has dissolve, let it cook for around 15 min. and turn it off. Put it hot in the sterilize jars and seal them, let the cool at room temperature and then store them in the fridge. Wash them in soapy water and rinse very well. Place them in an oven tray and put them in the oven to dry. If you are using Kilner jars, sterilize their lids in boiling water. It is Monday, after a nice relaxing weekend I finally sit down to write some of the recipes I have done last week, but I haven’t found the time to share them with you. Today I am sharing this lovely soup from the state of Michoacan, it is called “Sopa Tarasca” (Tarasca Soup), it was created by Don Felipe Oseguera in 1966, when he opened his restaurant in Michoacan, he wanted to make a very special menu and this soup was created by him and his family and because they were talking about Janitzio, a town in Michoacan and people from there are called “tarascos”, that is why they gave this name to this beautiful and delicious soup. The main ingredients for this soup are the ancho chillies, beans and tomatoes, all this ingredients give this soup a wonderful taste, perfect for a winter day like today, it is so easy to make that it won’t take you long to prepare it and enjoy it. Traditionally this soup has to look a bit more red than the one I made, because of the tomatoes, but I love ancho chillies, so I decided to use two, so that is why my soup looks a bit brown. Michoacan is a lovely state in western Mexico, the most famous town I think is Patzcuaro, famous for its lake and the fishermen that has a special way to catch fish, if you ever have the opportunity to visit Mexico, I highly recommend you to visit Michoacan. In a large casserole dish heat the oil and add the onion and garlic, once the onion has been fried for 3-5 min add the tomatoes and cook for 10 min. In the meantime, put the dried ancho chillie in hot boiling water for 5 min to soften, then put it in a blender together with the beans, fried tortilla, some of the chicken stock and blend until getting a nice smooth sauce and reserve. Do the same with the tomatoes, onion and garlic, once everything is blended, put all the ingredients back to the casserole, add the rest of the stock and make a bouquet garni with all the herbs and add it to the soup. Cook for 15 min. Check the seasoning before turning the heating off. Serve with fresh or feta cheese, fried tortilla and ancho chillli cut in julienne and enjoy it with some warm corn tortillas and fresh avocado slices. 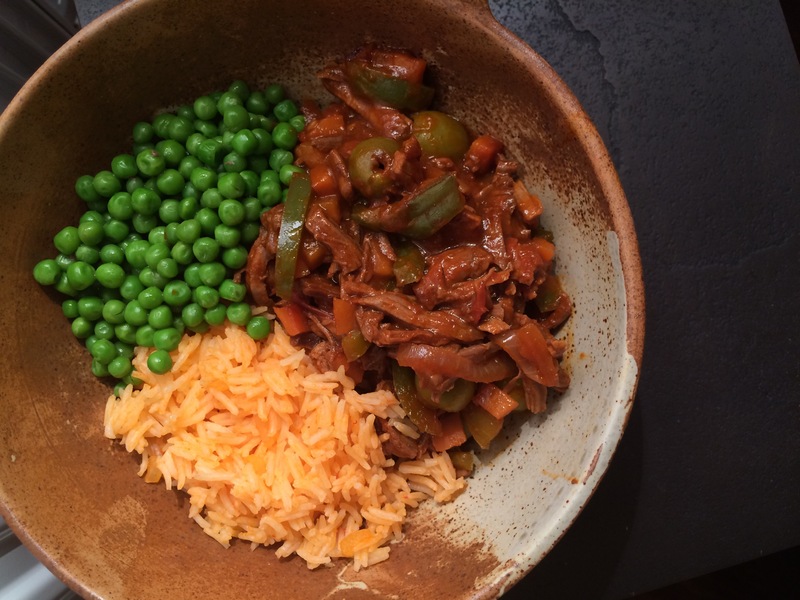 Today I was feeling a bit down, it wasn’t a good day, so I didn’t have the energy of cooking a proper meal, in fact, I didn’t want to cook at all, but as a mother I can’t just say “I’m not cooking”, but I can make quick and easy recipes like this one. So I went into the kitchen and my first thought was, yes! you guessed! pasta the saviour ingredient for all the mothers out there, but I did’t want pasta with a sauce from a jar, so I started to look around my kitchen and I had an idea, “I will do a pasta bake with a Mexican touch”, but again, another but!, I’m trying to eat healthy, so I thought “Pasta soup with kale and peas!, yes, that is a good combination, ah! and for the Mexican touch? my last dried ancho chillie” (yes, I thought all that in a split of a second). So this is the outcome of my thoughts! Heat the oil in a large casserole, add the kale and cook for 5 min, then add the pasta, peas, chicken or vegetable stock, salt and pepper and continue cooking for around 10 min. Then add the dried ancho chilli to the soup to soften. Once soften transfer it to the blender and add the fresh tomato, spring onion and some of the liquid from the soup. Blend well until smooth. Sieve the salsa and add it to the soup. Cook for 10 more min and serve with fresh or fetta cheese and chopped coriander. You can use any other small pasta you fancy like stars, alphabet, shells. Add more green vegetables like courgettes, spinach, green beans. Today I decided to make a tomato soup, an old English classic and one of my hubby’s favourite soup, but I put a little Mexican twist to it to make it more interesting, deliciuous and yes! you guessed, spicy! So here is the quick recipe and I hope you enjoy it as much as my son Emilio and I did. Preheat the oven to 180 C degrees or gas mark 6. In the meantime prepare the salsa bandera, mix the chopped tomato, shallot and jalapeño pepper, add the coriander, salt and pepper to taste and squeeze some lemon to give more flavour. Once the tomatoes are roasted place them in a blender with the shallot, vegetable stock and chipotle chilli and blend until smooth, then sieve it and put it in a saucepan. Cook for 10 more min. 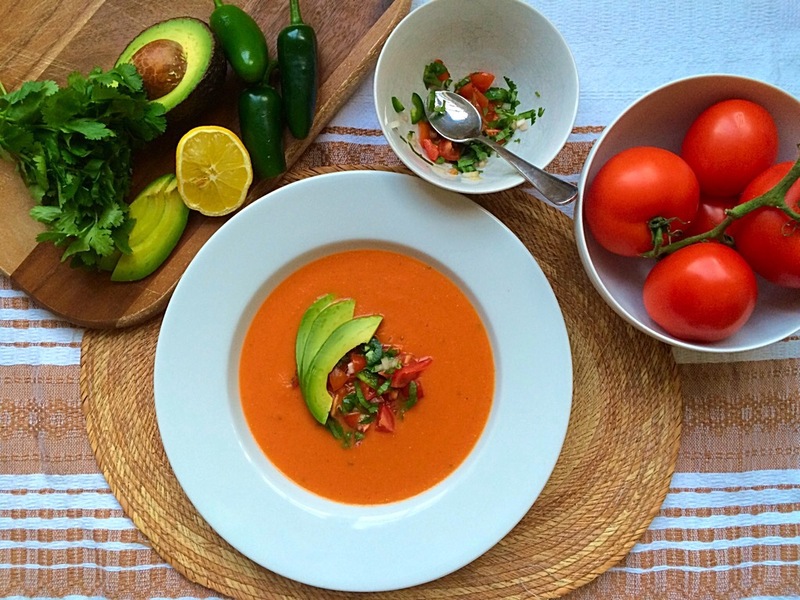 Serve in a bowl and garnish with the salsa bandera and the avocado slices. One of the things that my family know how to do very well is a BBQ, beef, seafood, fish, you name it, we’ll do it in a BBQ. My dad was a complete and utter fun of them and he used to put so much effort into them, if we were going to have a BBQ with beef, he used to prepare everything so thoroughly and if we were going to have a “Mariscada”, well, it was just wonderful! and this recipe, Zarandeado Style fish, has been always in our seafood/fish BBQs. 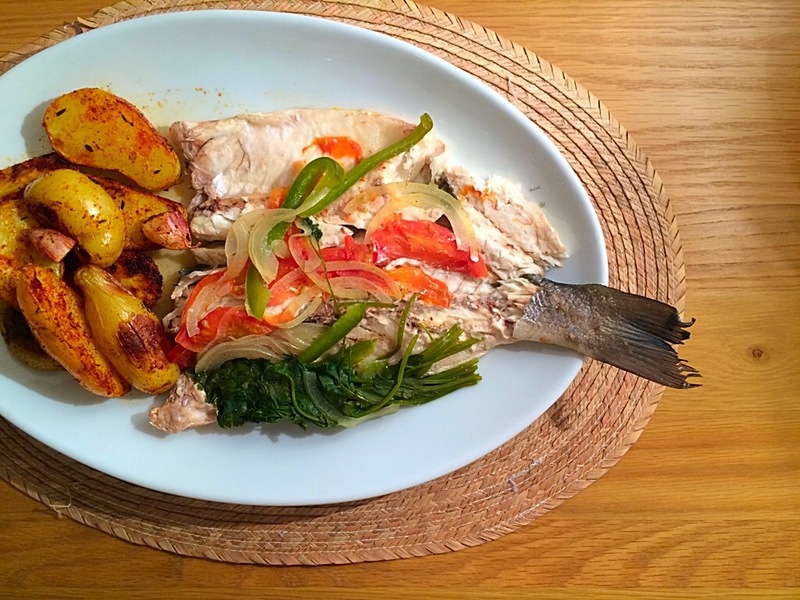 Traditionally this recipe is done on a charcoal grill in the garden, but I did mine in the oven or you can also do it on a frying pan and as I said, this is my family’s recipe, so it changes slightly from the traditional Zarandeado fish recipe. 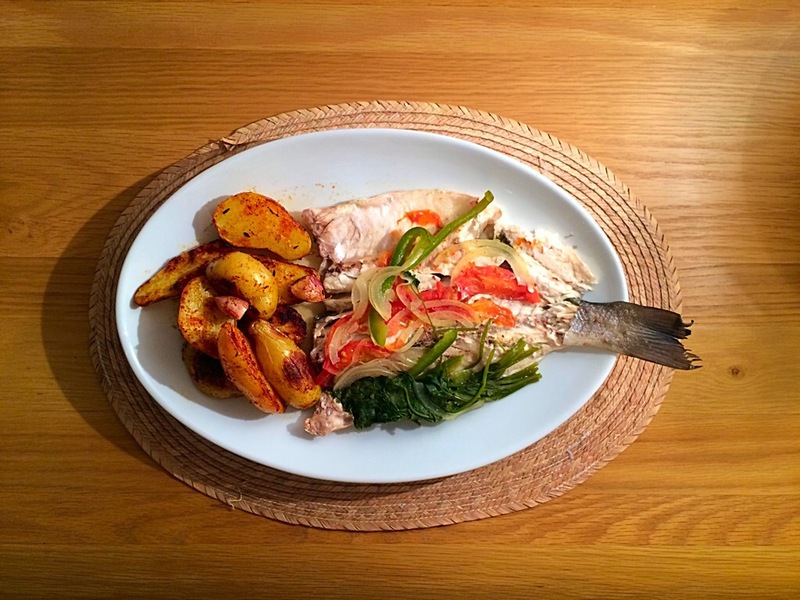 For this recipe I used two whole sea bass, but if you are catering for a larger crowd, you can always use any larger white meat fish, like a large cod or haddock, I also add a bit of coriander to mine and a slice of lemon, but it is not necessary as my family recipe only goes with tomato, onion and green pepper. The Zarandeado Style fish is a recipe from the north of Mexico, a place call, Nayarit, but Sinaloa, another state in the north of Mexico, has adopted the recipe as well, so my recipe comes from Sinaloa because my mum was born there, but in my family we tent to add white wine to make the fish even more tastier and also because in Baja California, the state where I am from, we have one of the most important wine regions in Mexico, Valle de Guadalupe. The fish you see below was made last summer by my brother-in-law when we went to Ensenada for our summer holidays. That day we had a Mariscada and one of the dishes was Pescado Zarandeado. Ask your fishmonger to clean and butterfly your fish, then stuff the fish one by one with the vegetables. Add 1 tbsp butter and mustard to each fish and a splash of dry white wine. Season with salt and pepper. Wrap them individually in aluminium foil and add a splash of dry white wine. Place them in a preheat oven to 190 ℃, 170 ℃ fan or gas mark 5 or place the parcels on a preheat frying pan. Cook for around 15 to 20 min. Have them with some Mexican rice or potatoes. First of all I wish you all a wonderful year and I hope you continue following me in my Mexican Food Memories adventures, this year will be full of great recipes, travels and more! Here is the first recipe of the year. It is January, I am sure you are all thinking about starting to get fit and eat healthier after all that Christmas and New Year’s dinner and drinks, well, good! that is the most sensible thing to do when you start a new year, but if you were Mexican, you were all be thinking about eating the Rosca de Reyes on January 6th. Rosca de Reyes or Roscón de Reyes is a Spanish and Latin America King’s cake pastry traditionally eaten to celebrate the arrival of the three wise men during Epyphany, traditionally the cake is made in a round or oval shape and decorated with dried or candied fruit and quince and a little plastic doll, representing baby Jesus, the little doll is placed inside the cake and in Mexico whoever finds the little doll has the “Tamales duty”, it means that that person will have to make tamales on February 2nd (Día de la Candelaría) and invite everyone who were that day eating Rosca. On the same day, in most of Spain and some countries in Latin America, children get presents, which are attributed to the Three Wise Men. In Mexico children usually leave their shoes by the door with a note for the Three Wise Men. In my family we used to get some money in our shoe, I used to love Kings’ Day very much, it was like another day to have fun, get together with family and friends and eat the nice and delicious cake with a nice hot Mexican chocolate. 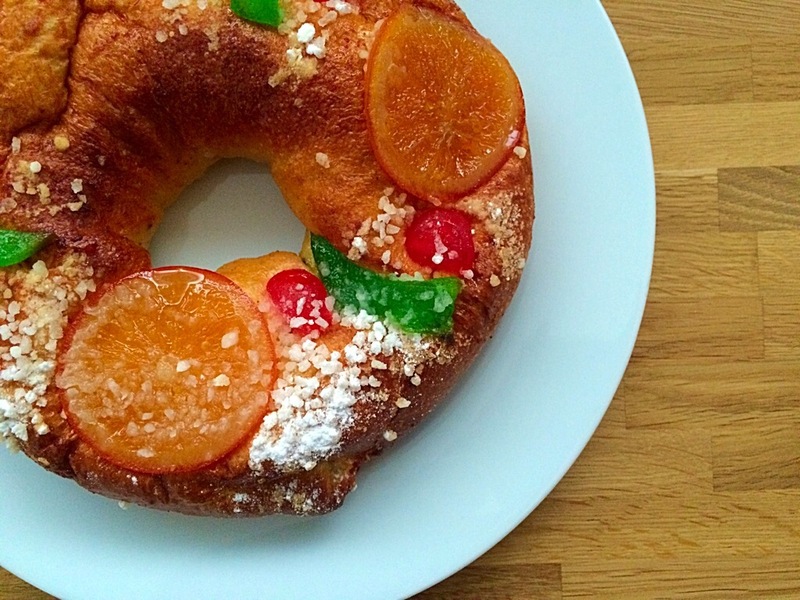 Today I am sharing this recipe with you, it is not my recipe and I didn’t make this rosca, I bought it in Barcelona in a very nice bakery and the guy there kindly share with me this recipe. I really hope you give this recipe a try, because you do not have to be religious to eat this lovely cake and it is a nice tradition, which is what I love. Preheat the oven to 180 degrees or gas mark 4. Then have all your ingredients ready to use on the surface you are going to work on. Place the 500 g flour on the surface that you are going to work, make a little hole in the middle so you can place the other ingredients. Add half of the sugar, butter, salt, 3 eggs and the orange blossom water and start mixing the ingredients, once they are mix, add the egg yolk, the rest of the sugar and the 15 g of easy bake yeast and start working the dough. Work the dough until all the ingredients come together and the dough feels flexible, usually this takes around 15 to 20 min. Oil a bowl and place the dough in there, cover it with a tea towel and let it rest in a warm place until it double its size. Take the dough out of the bowl and make a long piece like a long worm, then place the marzipan in the middle of the dough and give it a round ring shape. Whisk an egg and using a baking brush, egg brush the dough. Decorate the cake with all the dry fruits and green quince placing them on top. Hide the little doll inside the dough. Let it rest again so it rises a bit more, around 10 to 15 min. Place it in the oven for around 20 min or until is brown and cooked. Sprinkle some white rock sugar to give it a nice finish. Have a slice with a nice hot cup of Mexican chocolate.